Coach's Corner - 1934 Tour of Japan autographed/certified large cut by 19! Go Back to Lot List 1934 Tour of Japan autographed/certified large cut by 19! This vintage piece of paper is approx. 6"x8.5" in size and in EX shape and beige in color. 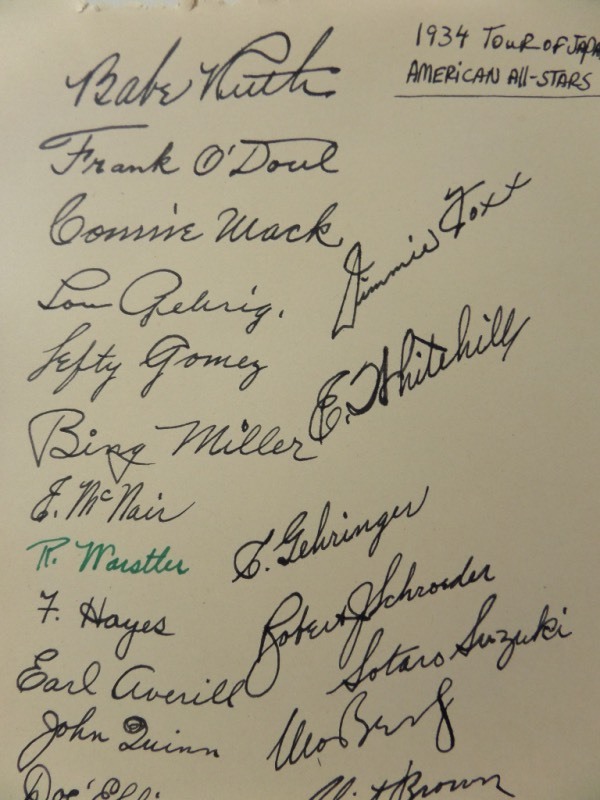 It comes signed in black & green inks by 19 members of this popular team. The autographs are in fantastic shape and included are big names like RUTH, GEHRIG, BERG, MACK, AVERILL, GEHRINGER,FOXX,GOMEZ,ETC.. Comes with a COA from East Coast Authenticators for authenticity purposes.